Hopefully these improvements will make the Code Converter even more useful in your daily coding lives. The next improvement to come should be comment conversion support (I know you all want it and I know NRefactory supports it). Watch for that update next week. Now have some fun and go convert some code! P.S. Can you do P.S. in blogs? Well I will. The Yahoo! Widgets Code Converter has been approved and is now in the Yahoo! Widgets Gallery. 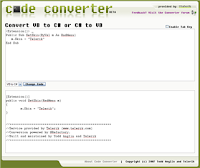 Download the widget here and bring the convenience of the Code Converter to your desktop.